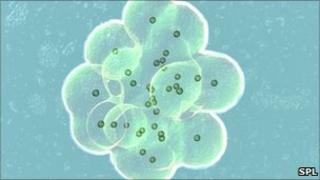 A high-profile fertility clinic in Hong Kong has admitted that it implanted two embryos into the wrong woman. The two women affected are receiving compensation. Other pregnant women who have used the clinic say they are appalled by the medical error. The government's Council on Human Reproductive Technology decided to take no action against the Victory ART Laboratory. The council ruled the mistake was down to human error, not systemic failings. A junior embryologist neglected to read the label on the embryos before they were implanted in the wrong woman through IVF. The clinic realised the error very quickly and the embryos were taken out and discarded. The woman whose embryos they were and the woman who had them implanted have both received counselling and have been offered compensation, the clinic told local media. Victory ART Laboratory has been allowed to stay open after the council's investigation decided it was a human error. Some pregnant women who have used the clinic reacted angrily online. They said they were horrified by the error, with one saying she would consider a DNA test once her baby was born to check if it was hers. The IVF clinic is one of a group whose patients include several Hong Kong celebrities. The company also has clinics in Malaysia and the Philippines.